This is a high-level summary of our key findings from the February 2017 Small Business Pulse Survey. This survey concentrated on What It Means to Be A Leader in 2017. Hundreds of entrepreneurs were surveyed to measure their outlook for the year ahead and to find out how they’re staying profitable in 2017. 95% of respondents have a positive outlook on their business. Only 5% have a negative outlook. 85% of the respondents have a positive outlook on the nation’s economy. Only 15% have a negative outlook. 52% of respondents believe that revenue/sales growth is the most important aspect of company culture. When it comes to culture, most owners believe that competition to the local market is the most important benefit to a company. 62% of respondents believe their employee count will be higher in 2017. We asked owners how they would rate themselves as a leader of their company. Only 5% rated themselves a perfect 10. All the owners surveyed rated themselves a 4 or higher. The owners surveyed worked on average 49.1 hours per week. Business owners were asked how their communication was handled. Most business owners handle their communication face-to-face, while the minority chose to handle their communication via phone. Business owners’ top three qualities as a leader are: positivity, ethics and confidence. The top three areas owners believe they need to improve on as a leader are: holding others accountable, tending to their team’s development and demonstrating a strong vision. When asked where they primarily go to for guidance in becoming a better leader, the top three answers were: non-business advisers, workshops/seminars/webinar and business partners. The owners surveyed believe that management experience is the most important aspect of becoming a leader. 59% of business owners conducted performance appraisals for their key personnel in 2016. 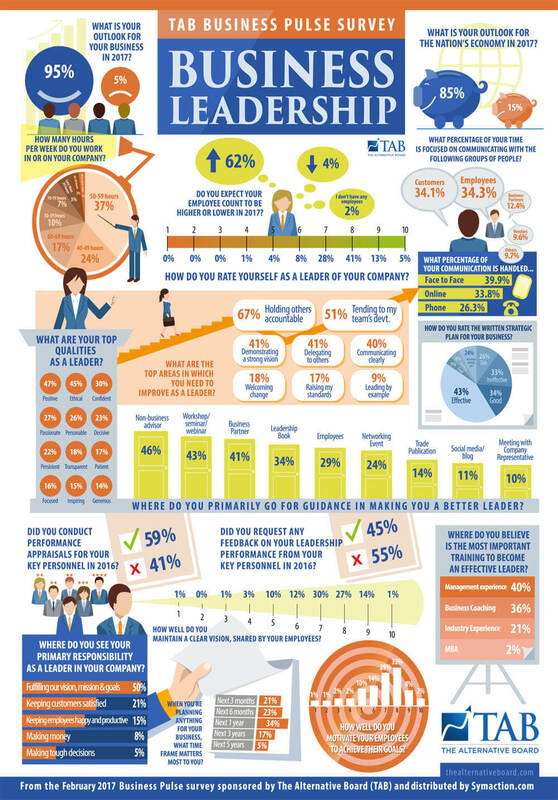 45% of those business owners requested feedback on their leadership performance. 50% of business owners believe their primary responsibility as a leader in their company is to fulfill their vision, mission and goals. When asked how well they maintain a clear vision shared by their employees, the majority rated themselves a 7 out of 10. The majority of business owners rated themselves an 8 out of 10 when asked how well they motivate their employees. 24% of owners do not have a written strategic business plan. 43% of business owners who do have a strategic plan believe it is effective. Only 4% of owners rate themselves a 10 on how well they follow their strategic plan. 54% of those who do not have a written strategic plan say it is because they are too busy. Sales revenue growth, profitability and increasing accountability are the top three area business owners believe they can improve on by implementing a written strategic plan. 34% of business owners believe that the time frame of 1 year is most important when planning anything for their business. Business owners were asked how satisfied they were with their succession plan. 30% of owners who were surveyed do not have a succession plan. 44% of the owners who do have succession plans were satisfied, while 26% of business owners are unsatisfied. 47% of business owners are most likely to sell and/or transition their business to an outside third party.